le nostre radici, i valori supremi. Welcome to the autumn issue of Vita Nuova. The quote above is from the Italian actor Roberto Benigni while performing ‘Tutto Dante’, screened at our AGM last February. His words are a reminder of who we are and where we come from regardless of where we live physically by choice or by fate. 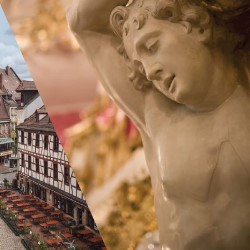 Benigni’s video-recording during the AGM touched the heart of all present – whether Italians, of Italian descendants or from an Italian background – making everybody proud of belonging to this beautiful Paese, cultura e lingua. Much has already happened since the beginning of the new year, including the election of three new Committee members during our AGM. I would like give a warm welcome to Gabriella Ferraro, Edmondo Palombo and Valeria Perino. At the same time, I would like to thank all other members for their hard work: Natasha Marona, Ciro Pipolo, Beatrice Barbieri, Emma Luxardo, Maria Russo, Antonio Mercorella, Anna Mazzone, Luigi Masciantonio, Stefano Bona and Isabella Bracco. Our association is successful thanks to the constant support of all our volunteers. 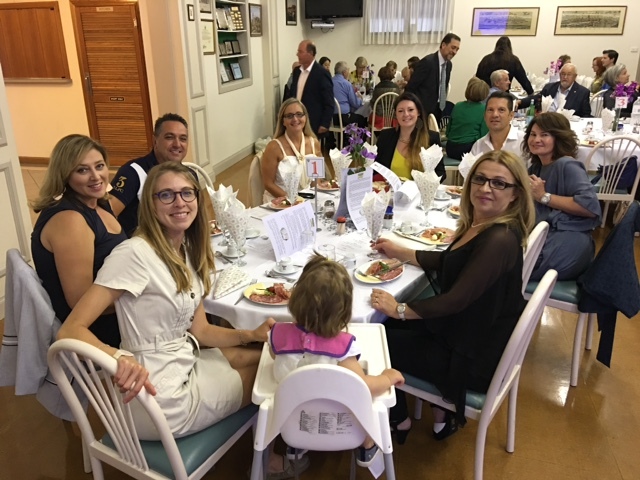 In February, the Society also supported and actively participated in the Annual Conference for Teachers of Italian in South Australia organised by Com.It.Es, the Italian Consulate and SAATI. 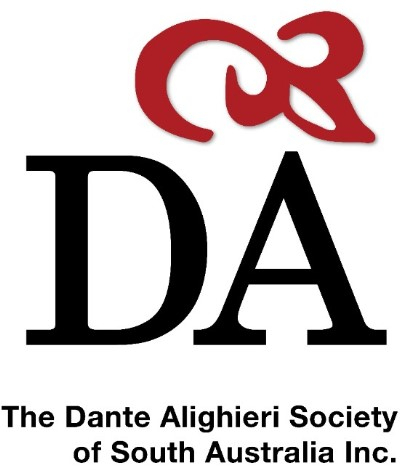 The Dante Alighieri Society, through its school project, shares the same vision of strengthening the learning and teaching of Italian in our schools. On 17th March, official day of ‘l’Unità Nazionale’, at the Toscana club we celebrated 70 years of the Constitution of the Italian Republic which was promulgated on 27th December 1947 and came into force on 1st January 1948. During the evening, a video-recording from, once again, the iconic actor Roberto Benigni, entertained the guests with a deep and emotional insight into the Italian Constitution and the Italian anthem, Fratelli d’Italia. The first semester of PLIDA Language Proficiency Courses started in March, running four classes for the first time: beginners (A1), continuers (A2), intermediate (B1) and upper intermediate speakers of the language (B2). The second semester will start in August; please contact us for enrolment and for more details. The “Caffe’ italiano” conversation classes also started in March, running on alternate Tuesdays. Thanks to a project in collaboration with Com.It.Es and Co.As.It, soon we will also deliver an Italian language and culture course for health carers within Italian-background aged-care facilities. 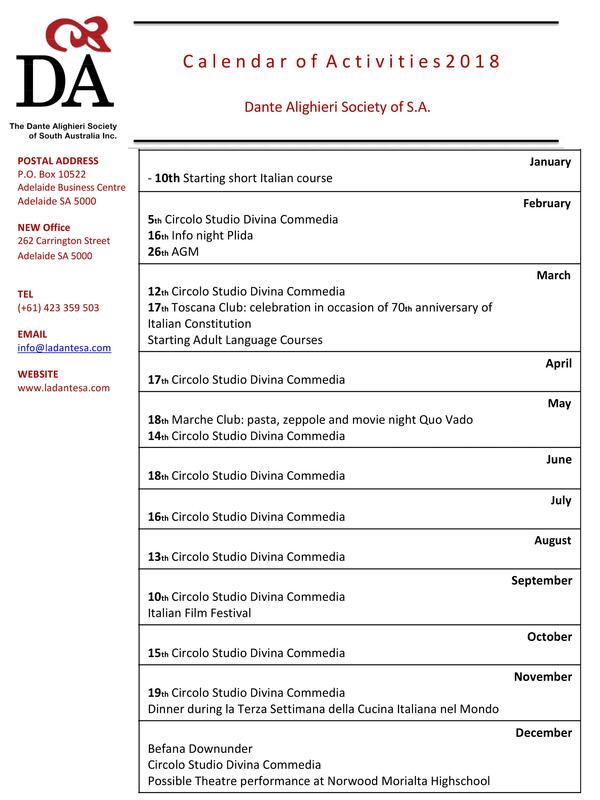 For the sixth year, the Dante Alighieri Society of South Australia has obtained funds from the Italian Ministry of Foreign Affairs to continue the program that allows Dante to employ a number of qualified Italian language assistants to work closely with Italian teachers in the classrooms of selected schools in South Australia. The program will start in May and will run throughout Term 2 and 3 of the school year. 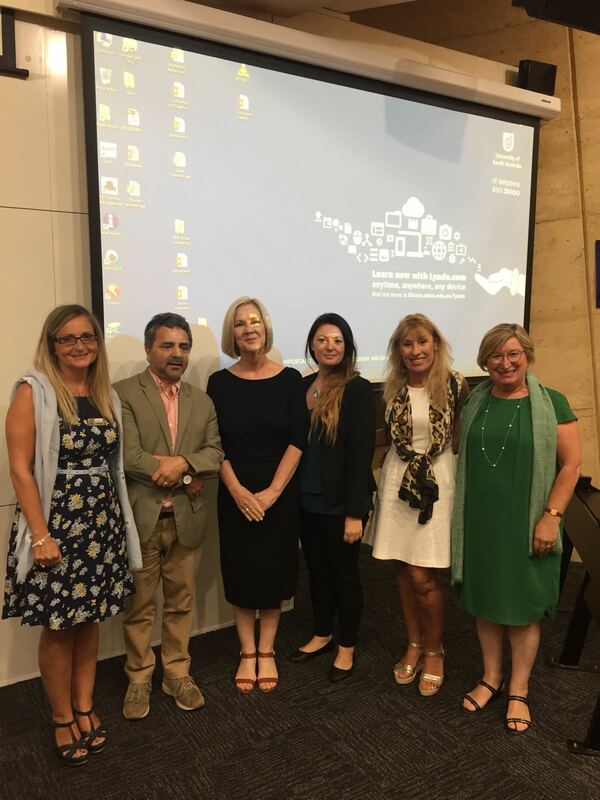 The program sees the successful cooperation with the SA Department of Education and Child Development and the Catholic Schools Office and the support of both the Italian Consulate and the Director of the Educational and Cultural Office in Canberra. Our aim is to support the development and spreading of the Italian language and culture in our communities and schools. 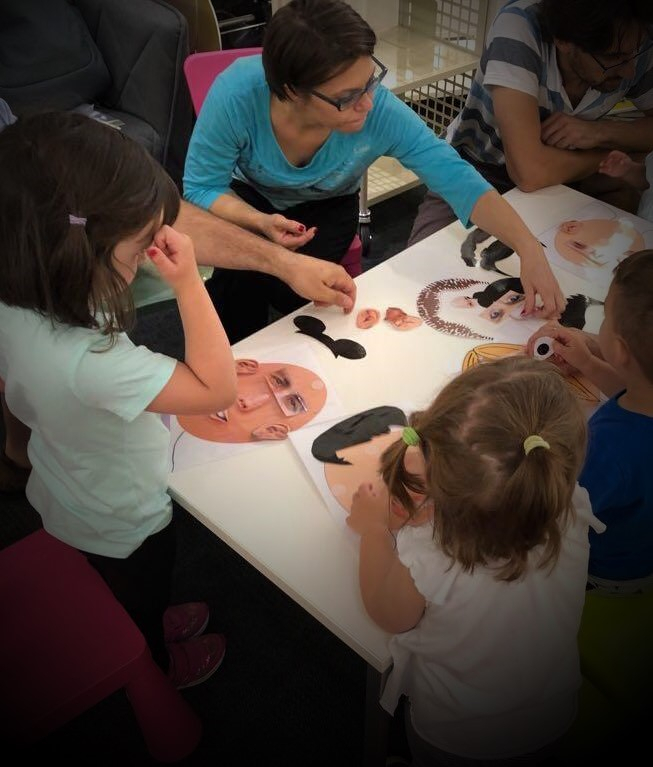 Following the positive feedback and response from the community wanting to involve young children in the learning of an additional language through fun activities and games, the Dante Alighieri Society has decided to run again the first Italian playgroup children’s language course (0-5 year olds). With the support of Campbelltown Council, the program started in March for all of Term 1 of the school year and we plan to run it for the remaining three school terms. The “Circolo Divina Commedia study group”, coordinated and run by the Treasurer Ciro Pipolo, in March resumed their monthly meetings for reading and discussions of “Purgatorio”. In pursuing the promotion of the Italian language and culture, both within and outside the Italian community, we will continue to design some of our social events maintaining a connection with all generations of the Italian community – those who came here a few decades ago and the ‘new Italians’ seeking a bright future far from home. After ‘la regione Campania’ last year, this year we will celebrate ‘la regione Marche’ at the Marche Club on Friday 18th May with a ‘pasta, zeppole & caffe’ dinner’ accompanied by varied entertainment highlighting cultural insights of the region. 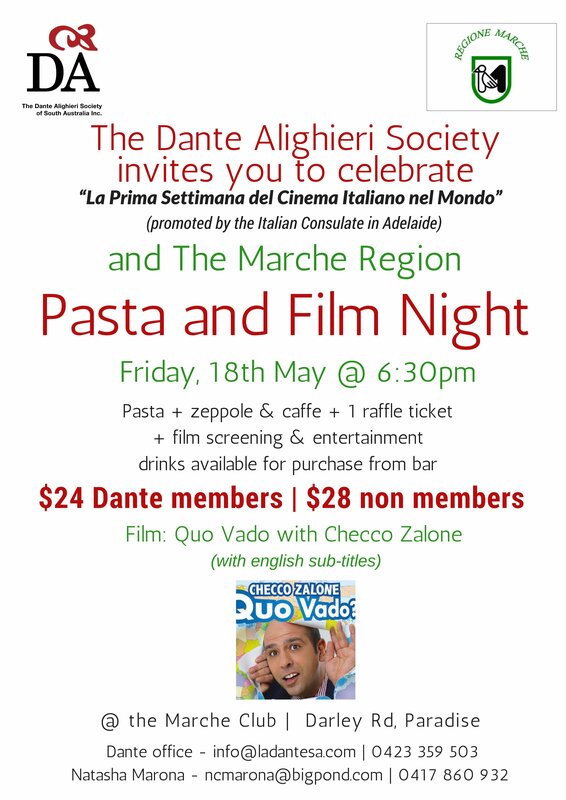 After the dinner, there will also be the screening of the movie Quo Vado with Checco Zalone (with English sub-titles) supporting “La Prima Settimana del Cinema Italiano nel Mondo” promoted by the Italian Consulate in Adelaide. “Terza Settimana della Cucina Italiana” – In November, we will continue to support the Italian Consulate’s program with a dinner for the opening night. “Befana Down Under”- In early December we will organise an entertainment day for children aged 3-10 with the arrival of ‘la BEFANA’. During the event children will learn about the history and tradition of ‘Befana’ in Italy. Grazie per aver acceso la scintilla che ha dato vita al fuoco ardente e sempre vivo della Dante Alighieri Society del Sud Australia. Silvia De Cesare, Dante Alighieri SA President, Professor Joseph Lo Bianco, Ms Susan Cameron, Executive Director, Learning Improvement, Department for Education and Child Development, Roberta Ronzitti, Italian Consul SA, Dr Anna Rita Tamponi, Director of the Educational and Cultural Office Canberra, Associate Professor Angela Scarino, University of South Australia. I am a first generation Australian born to Calabrian parents who migrated to South Australia from Palmi, Reggio Calabria in 1963. 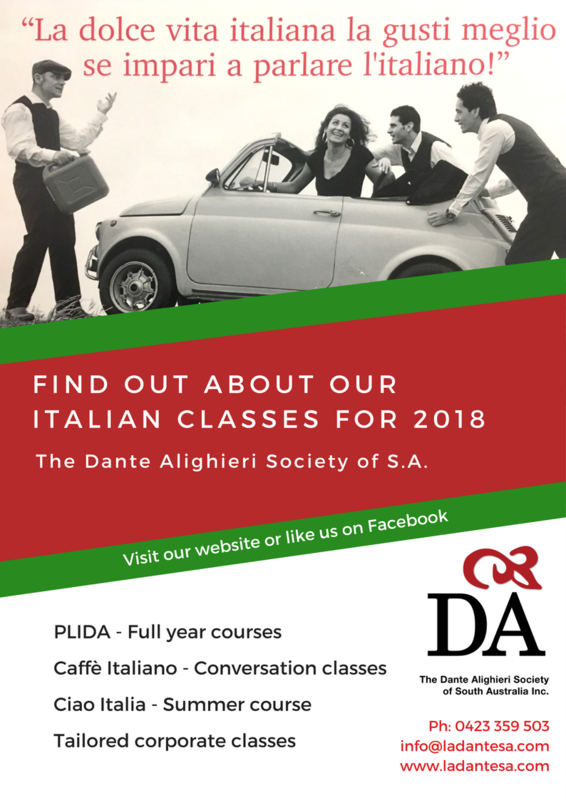 As a proud Italo-Australian I am passionate about promoting and maintaining the richness of Italian culture and traditions, history, music and language in Adelaide. My interests include cooking, spending time with family and friends, music and the arts, the outdoors, reading and travelling. I look forward to meeting you at Dante’s next event. I am from Termoli, a nice town located in Molise, a region by the Adriatic sea. 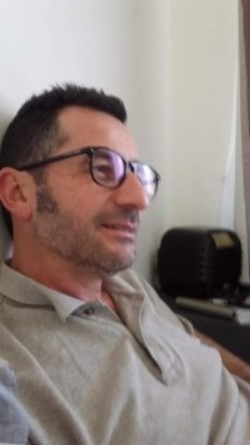 I am an Italian teacher in a Primary School where I worked with children from the age of 6 to 10 years old for about twenty years. I love to spend my free time cooking, reading and travelling. 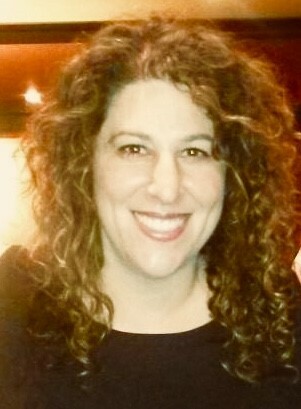 I am passionate about the Italian culture and I am interested in sharing with the wider community the many aspects that make it so special and unique. I come from Termoli, a town located on the Adriatic sea in the Molise region. I arrived in Australia with my family when I was 19 years old. I have had the opportunity to study and obtain a qualification as a Registered Nurse and have been working in the health system for many years. Today I am well integrated in the Australian society and work as Director of Nursing in a public hospital.I have never forgotten my Italian background something that has positively influenced me throughout my life and career. I am interested in Italian, Australian and world politics. We have already completed Term 1 of Dante Kids and we have continued on from last year trying to make the playgroup better than ever. Our wonderful teacher, Pamela, brings so much energy, creativity and fun to each session while providing a structured learning environment for all the children. Towards the end of the term, Dante Kids changed venue from the Campbelltown Library to the Marchant Community Centre nearby which is a lovely building where we can call home. If you have children or grand children that you’d like to learn Italian, come along to the next playgroup. We’d love to see you there! From Term 2, the playgroup will be held from 10.30am to 12pm every Saturday morning. Quest’anno si celebrano i 70 anni della Costituzione della Repubblica italiana, approvata dall’Assemblea Costituente il 22 dicembre 1947 con 453 voti a favore e 62 contro. La Costituzione e’ stata promulgata il 27 dicembre con l’edizione straordinaria della Gazzetta Ufficiale n. 298 ed e’ entrata in vigore il 1º gennaio 1948. L’Assemblea Costituente fu eletta tramite suffragio universale il 2 giugno 1946 insieme al referendum sull’abolizione della monarchia. Tre i gruppi rappresentativi prevalenti: la Democrazia Cristiana, il Partito socialista e il Partito comunista. Appena eletta, l’Assemblea nominò al suo interno una Commissione per la Costituzione, composta di 75 membri incaricati di stendere il progetto generale della carta costituzionale. A sua volta, la Commissione si suddivise in tre sottocommissioni: diritti e doveri dei cittadini, organizzazione costituzionale dello Stato e rapporti economici e sociali. La Costituzione è la principale fonte del diritto della Repubblica Italiana, cioè quella dalla quale dipendono gerarchicamente tutte le altre norme giuridiche dell’ordinamento dello Stato. – Disposizioni transitorie e finali (disposizioni I-XVIII). Tali diritti sono considerati diritti naturali, non creati giuridicamente dallo Stato, ma ad esso preesistenti e come definiti dalla dichiarazione universale dei diritti umani promulgata dall’Organizzazione delle Nazioni Unite. 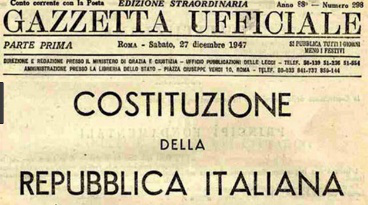 This year we celebrate 70 years of the Constitution of the Italian Republic, enacted by the Constituent Assembly on 22 December 1947, with 453 votes in favour and 62 against. The Constitution was promulgated in the extraordinary edition of Gazzetta Ufficiale No. 298 on 27 December 1947 and came into force on 1 January 1948. The Constituent Assembly was elected by universal suffrage on 2 June 1946, at the same time as a referendum on the abolition of the monarchy. The groups that composed the Constituent Assembly covered a wide range of the political spectrum, with the prevalence of three major groups, namely Christian Democratics, Liberals and Leftists. All the different political and social views of the Assembly contributed in shaping and influencing the final text of the Constitution. There were 556 members of the Constituent Assembly, of which 21 were women. These members came from all walks of life, including politicians, philosophers and partisans, and many of them went on to become important figures in Italian political history. The Fundamental Principles are unchangeable, and solemnly declare the unshakeable foundations on which the new State was constructed, starting with the democratic nature of the Republic, in which the sovereignty belongs to the people and is exercised by the people in the forms and within the limits of the Constitution. 18 Disposizioni transitorie e finali, the Transitory and Final Provisions. La ragione dell’esistenza di questo circolo è presto spiegata: io e Donata Galluccio ci meravigliavamo del fatto che un’associazione chiamata Dante Alighieri, che ha come fine la diffusione della lingua e della cultura italiane, non avesse un gruppo di lettura della Divina Commedia e così, dopo varie richieste, alla fine abbiamo ottenuto l’approvazione per l’utilizzo una volta al mese della sala riunioni.Ci incontriamo quindi una volta al mese, di solito il secondo lunedì, e attorno al tavolo siamo di solito sette o otto. Ci sono le fedelissime Margaret Baker, Donata Galluccio, Marina Berton e Lucia Zuzolo, che fanno parte del club dall’inizio mentre Claudia Baccanello è diventata dei nostri da poco tempo. Siamo entrati nell’Inferno piu o meno cinque anni fa. A farci da guida c’era Luciana d’Arcangeli, che assieme a Dante e Virgilio ci ha fatto attraversare tutti i gironi dell’inferno. Luciana ci teneva per mano mentre leggeva e commentava ogni canto. 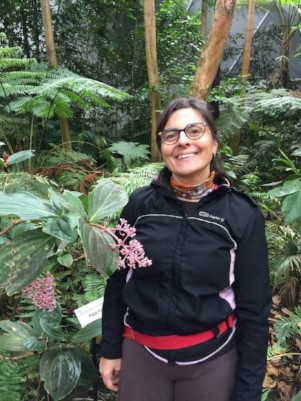 Una volta concluso il suo mandato di Presidente della Dante di Adelaide, Luciana ci ha lasciati e adesso vaghiamo da soli per la montagna Purgatorio. A turno leggiamo e commentiamo le terzine del Canto e cerchiamo di spiegarne al meglio il significato. Abbiamo diverse edizioni dei commenti alla Divina Commedia, che leggiamo a turno per approfondire la spiegazione. Alcuni di noi, in particolare Marina e Margaret, fanno delle ricerche pertinenti al canto che leggeremo e una volta in riunione ci illuminano con nuove informazioni. Al Circolo leggiamo e commentiamo la Divina Commedia in italiano anche se qualche volta c’è la possibilità di leggere alcuni commenti in inglese. La partecipazione al Circolo e’ gratuita (basta essere membri della Dante Alighieri) e la partecipazione nel leggere e commentare alla riunione è facoltativa. Abbiamo già deciso che quando finiremo il Paradiso (fra quattro o cinque anni), ricominceremo un’altra volta dall’Inferno per tenere viva la tradizione e lo studio della Divina Commedia. Abbiamo un gruppo email che usiamo per comunicare con i membri del Circolo. Donata Galluccio e’ l’amministratore e se volete ricevere ulteriori informazioni ed essere inseriti nel Gruppo, potete inviare una email a donata.galluccio@gmail.com.